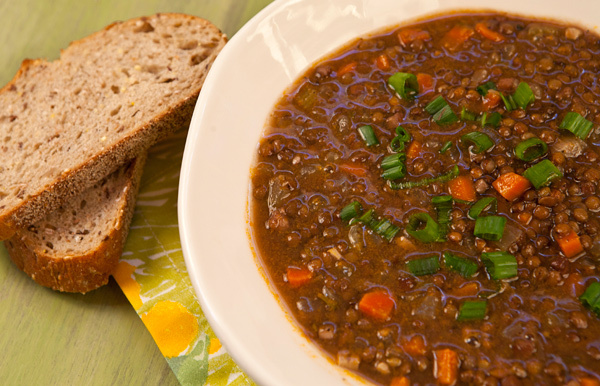 In Italy, it is a tradition to eat lentils on New Years which is said to inspire prosperity. Though it is fun to follow traditions such as this one, I never need a lot of convincing to eat lentils and what better way to start off 2014 in a healthy fashion? These amazing little beans are high in fiber so they help to lower cholesterol and regulate blood sugar. A true fat free source of protein, beans also contain a high source of folate, B vitamins, and iron. Though I do like all dried beans, lentils are a particular favorite of mine as they do not require soaking and cook rather quickly. It is a good tip not to store newly purchased lentils with older ones as the older they are, the longer they will take to cook. 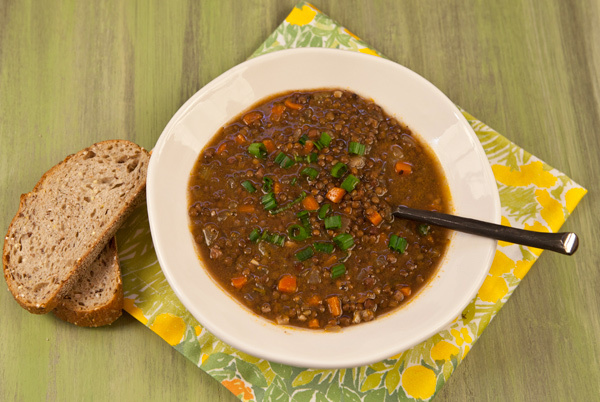 I decided to keep this version of lentil soup simple, so I used mostly vegetables, lentils, and just a little chopped turkey bacon for flavoring. You could replace the turkey bacon with sausage, and add in some diced sweet potatoes, winter squash, as well as some healthy green veggie such as kale if you like. A little lemon juice really brings soups like this one to life, so don’t forget this step even though it may not seem important. You can garnish this soup with just about anything……my husband likes to add a dollop of fat free Greek yogurt, while I like chopped green onions and a tablespoon or two of grated Pecorino Romano cheese. Using turkey bacon reduces calories from fat while still adding flavor. In a large stock pot, heat the olive oil over medium heat until lightly smoking. Add the bacon, onions, carrots, celery, and garlic. Continue to cook until the vegetables begin to soften, about 5 minutes. Add the tomato paste, lentils, broth, parsley, oregano, salt and pepper. Stir to mix well and bring to a boil. Reduce the heat to a simmer, and continue to cook until the lentils are just tender to the bite, about 30 to 35 minutes. Stir in the lemon juice, and serve the soup very warm with garnish of choice.